Choose your title and cohosts with care! I didn’t actually do the first part of this. I came up with Friday Five randomly and just ran with it. It’s worked out well for us, but I probably should’ve spent more time thinking about the topic. Luckily, y’all love the Friday Five and we’ve been able to do a lot with the theme. The second part of this is super important. Having cohosts that have audiences that are a little bit different than yours is a great way to get all cohosts some new readers. Mar and Cynthia have been awesome cohosts and we love doing the Friday Five together. Choose your partners carefully! Share your topic proactively. This is something we try hard to do each week. Each of us has a static page that list that week’s theme and links to previous Friday Five topics. You can see what I mean about the page here, here (Mar’s page) and here (Cynthia’s page). In addition to our pages, we all tweet and announce the theme on facebook regularly. Give your linkup folks some love. The three of us (Cynthia, Mar and I) try to visit each blog that links up with us. Now that we regularly have 50 or more blogs linking up, it sometimes takes me a full week — but we’re still committed to doing that. This is part of growing a community – and that’s really what my goal was with starting a linkup. I have made some great friends through our linkup and I know others have as well. Don’t be afraid to make rules. Inevitably you are going to have folks who aren’t interested in building community. They will drop their link in your linkup and not comment on anyone’s blog, not linkup the proper post (most likely they will just put in a link to their blog, not even a post) and you will be annoyed. Rightfully so. However, if you haven’t taken the time to set out rules, then that was your bad. We now clearly articulate the right way to linkup with us on the Friday Five. And for those who don’t play nicely? We don’t hesitate to delete a link. Actually, first we give folks the benefit of the doubt and send an email asking them to please follow the linkup rules. After repeated violations, though…we will (and have, more than once) delete a link. Don’t be afraid to do that. Are you hosting a linkup? Leave a link to it in the comments so we can all check it out! These are great tips and perfect bc I am starting my Meatless Monday link up next week. I’m really excited about it and it is a natural for me. I’ve loved being part of the Friday Five and have made some great blogging connections. i love that there are different, awesome linkups just about every day of the week! Thanks for these great tips! I love link ups and yours is so well organized 🙂 The bit about the rules is so important. When I started blogging, I had no idea that there even were rules or what they would be so it’s nice to see them clearly laid out. thank you for the compliment – glad that you enjoy the linkup! Great advice and great theme for your link up! I have thought of starting one but the technical part holds me back. When trying to join others it’s usually tough based on themes and adding links via mobile or multiple badges on my page but I love your universal themes and being able to mention the 3 hosts in your blog post! Nadeen recently posted…Hiking up the Inca Trail to Machu Picchu! thanks nadeen! i’m glad you have enjoyed the link up – we appreciate you! this is an awesome post!!! you and Cynthia have been great co-hosts and I’ve loved seeing our linkup grow. I think another tip to add is “know your why”. I say this all the time about blogging in general but I see so many people start linkups b/c they think it’s the thing to do or they see others have success with it but it’s not a bandwagon thing. Your tip #1 supports that knowing what you are talking about and with whom is SO important!! thanks, friend! it is really fun to look back at early linkups and see the growth. and yes, not doing something just because everyone else is doing it is SO important!! I love your link-up! You run it so well and I’ve discovered fun new blogs to follow from the people who participate. Awesome tips, well said. 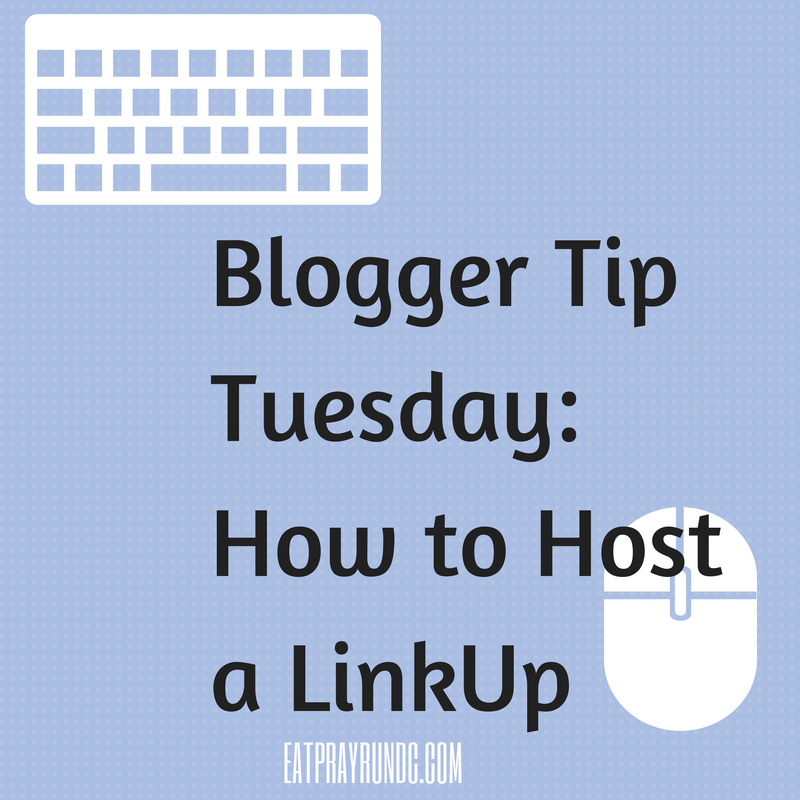 Link ups are super popular so I’m glad you’re helping people out who want to host their own! It can either be super awesomely popular… or totally flop. No one wants the latter to happen to them! Thank you! They (like most things) take time and patience to grow! I’ve been thinking about starting a linkup for a while now, but the right inspiration just hasn’t hit me yet. I’m sure it will on a run, and I’ll just have to remember what it was when I finish my run! 🙂 As always, thanks for your tips! Thanks Deb — I bet a linkup you hosted would be awesome! I love the story behind the Friday Five! I’ve seen many other linkups in my day, but FF is the first one where I really consider all the hosts to be my friends. <3 You guys are awesome! Awesome! I have printed it out for future use! Thank you! Mary Beth Jackson recently posted…A 12 minute mile is just as far as a 6 minute mile! This is great! I just started my own last week, hoping it will take off like yours! Sue @ This Mama Runs for Cupcakes recently posted…Tuesdays on the Run: Crosstraining! Your linkup is the first one and only one I do consistently. That’s because its run so well and isn’t overwhelmed. Thanks Chelle – we love having you link up! You’re always so helpful :). I’ve been wanting to host my own linkup for a while now, so it’s great to hear these tips. Thanks, girl! Great tips, Courtney! As you know, I recently started the Weekend Update link-up; it’s been fun, and I appreciate all of your help/guidance through your posts on blogging. Thank you so much for introducing me to my first link-up; I love the Friday Five and the DC Trifecta is awesome! thanks Tara! Your linkup seems to be going very well so far! Great tips! I love Friday Five and think that you guys are doing such a great job with it. If I ever start my own linkup I’ll have to keep these tips in mind! Kristen recently posted…It’s PSL Time!